Folk-Minded Siblings Bring Full Band to S.B. Chris (left) and Oliver Wood bring the brotherly love to SOhO on Friday. BIG SCREEN, SMALL STAGE: As evidenced in this week’s cover story, the 2012 Santa Barbara International Film Fest (SBIFF) is rife with goodies of the sonic variety. But even those operating outside of the SBIFF umbrella seem keen on making the next few weeks bountiful in the music department. Just take a look at this Friday’s offerings, which run the gamut from cerebral folk to indie pop to some of the county’s most promising young players. 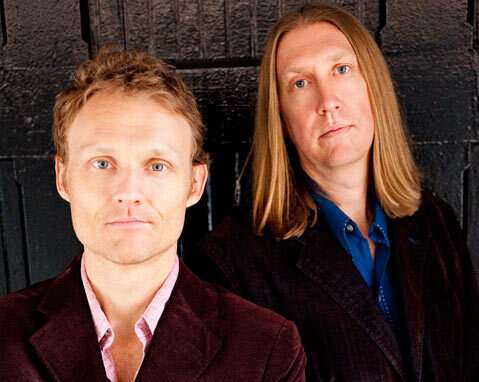 At SOhO, Colorado siblings The Wood Brothers will share their highly stylized brand of rootsy folk rock. The duo, made up of real-life bros Oliver and Chris Wood, lay claim to one of the more genuinely refreshing backstories in modern music. After a childhood spent playing together, both went their own musical ways; Oliver formed King Johnson with buddy Chris Long, while Chris joined drummer Billy Martin and keyboardist John Medeski to create Medeski Martin & Wood. In 2004, after 15 years of dabbling in music separately, the brothers reconvened on the road and started penning tunes. Most recently, the pair completed Smoke Ring Halo, their third — and arguably best — record to date. With a combined three decades of professional gigging under their belts, Oliver and Chris play off each other with a level of ease and familiarity that few band members ever truly reach. Stylistically, their music is a grab-bag mix of upbeat folk, history-imbued roots rock, twangy bluegrass, and funky country, with each element easily traceable to one (or both) of the brothers’ musical back catalogs. Needless to say, I’m expecting a whole lot of boot stomping and two-stepping come showtime. The Wood Brothers play SOhO Restaurant & Music Club (1221 State St.) on Friday, January 27, at 8 p.m. For tickets and info, call 962-7776 or visit sohosb.com. OFF THE BEATEN PATH: This Friday also brings with it a collection of promising shows at some oft-overlooked locations. From 7-10 p.m., Cold Spring Tavern (5995 Stagecoach Rd.) plays host to Lompoc buzz-maker Emily Wryn and Downtown Sound battle of the bands winner Saint Anne’s Place. Since stumbling upon both acts — and having my face melted by Saint Anne’s — Wryn’s been on my list of must-sees. While her oeuvre proves to be a bit tricky to track down online, a simple YouTube search quickly clarifies what all the hype’s about. Accompanied by nothing more than an acoustic guitar, Wryn’s voice is undeniably ear-perking; her deliveries are a heady combination of Florence Welch–style forcefulness and Laura Veirs–esque folk sultriness. Call 967-0066 for info. Closer to home, Whiskey Richard’s (435 State St.) hosts a solid double bill of solid talent featuring lo-fi pop rockers Dante Elephante and newcomers Resident Peasant. Led by My Satellite member Andy Marshall, Peasant is a huge-sounding, folk-inspired collective that calls to mind the baroque experimentalism of bands like Grizzly Bear and the vocal tones of PDX faves Blind Pilot. (Think reverb-laden, speak-sing deliveries and trumpet, sax, and mandolin colorings.) Comparisons aside, Marshall’s ripe-for-downloading 2011 debut, Mosaic Melody, is undoubtedly one of the more promising recordings to come out of a Santa Barbaran of late and well worth a virtual spin. For show info, call 963-1786, and to check out Resident Peasant online, visit residentpeasant.bandcamp.com. WINS AND LOSSES: While I’ve yet to find a person who did score tickets to this year’s two-weekend-long, record-setting Coachella Valley Music & Arts Festival, I’m finding more and more reasons to celebrate the damn thing anyway. That’s mostly because 2012 marks some of the greatest Coachella-born “gets” for Santa Barbarans yet. In addition to the (very sold-out) April 12 Radiohead/Other Lives show at the S.B. Bowl, we’ll be seeing club shows from bands like tUnE-yArDs (Apr. 15 at SOhO), M. Ward (Apr. 14 at SOhO), and Florence + the Machine (Apr. 14 at the S.B. Bowl). Who needs three days of heat exhaustion anyway, am I right?